St Kitts and Nevis is getting a climate-related Caribbean Development Bank grant of $538,000 euros. The CDB says the funds will facilitate the conducting of a climate risk and vulnerability assessment of the federation’s coastal road infrastructure. The CDB grant will also be used to prepare designs for the rehabilitation of two high-priority sites, according to a release from the regional Bank. The bank’s board of directors has approved millions in loans and grants for ten borrowing member countries, including the grant to St Kitts and Nevis. In the case of Dominica the CDB has approved a US$12 million line of credit to support education and housing. The loan to the Dominica Agricultural Industrial and Development Bank is intended to assist in providing finance for student loans, and low and lower-middle income housing that, combined, is expected to benefit 400 people. Haiti is being given a significant CDB grant to improve climate resilience, and disaster risk management. The CDB says the grant of US$5.5 million to the Government of Haiti is to improve climate resilience and disaster risk management on an island off the country’s southern peninsula. St Vincent and the Grenadines is meanwhile being allocated five million US dollars in loans and grants in additional support for the transformation of the country’s energy sector. Other projects have been approved in The Bahamas, Belize, Grenada, Guyana, Suriname and the Turks and Caicos Islands. PRESS RELEASE – Belmopan, Belize; May 5, 2017 – The Caribbean Community Climate Change Centre (CCCCC) in partnership with the United States Agency for International Development/ Eastern and Southern Caribbean (USAID/ESC) under the USAID Climate Change Adaptation Program (USAID CCAP) are hosting a Caribbean Climate Online Risk and Adaptation Tool (CCORAL) Training Workshop in Antigua and Barbuda on May 8th – 12th at the Department of Environment Conference Room. 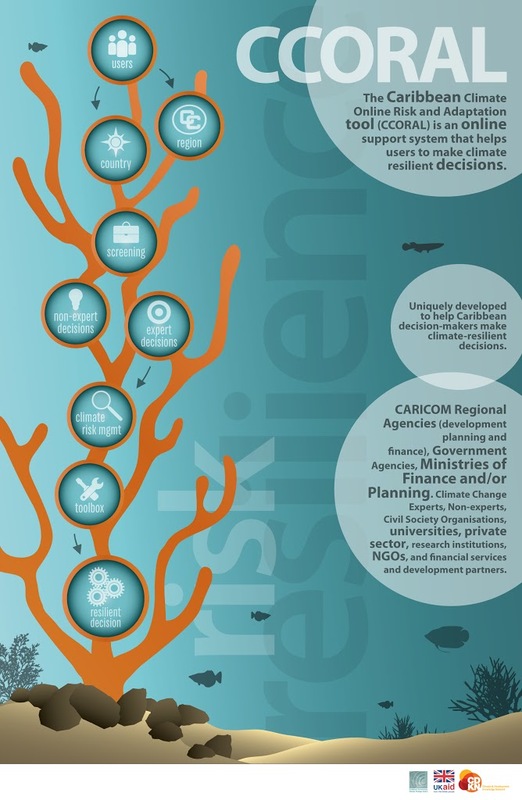 CCORAL, is an online climate risk management tool that guides developers to include best-practises, strategies and systems into development planning that will ensure that across the region, there is a comprehensive approach to climate change risk assessment and adaptation for building climate resiliency in decision-making. It provides users a platform for identifying appropriate responses to the impacts of short and long term climate conditions by applying a risk management approach to development planning. The training workshop is targeting key government, private sector and non-governmental organisations, agencies/institutions as part of a national capacity-building exercise aimed at inculcating a risk management ethos in decision-making. Through use of this online application tool, participants will evaluate national developmental issues and present their findings to senior policy and decision makers on completion of these evaluation exercises. The USAID CCAP being implemented by the CCCCC commits US$25.6 million over four (4) years to boost climate resilient development and reduce climate change induced risks to human and natural assets in ten (10) countries. The beneficiary countries are Antigua and Barbuda, Dominica, Grenada, Guyana, St. Kitts and Nevis, Saint Lucia, St. Vincent and the Grenadines, Barbados, Trinidad and Tobago, and Suriname. Peruse the CCORAL Fact Sheet and the CCORAL Brochure. The Barbados-based Caribbean Development Bank (CDB) says it is providing US$40 million in funding for poverty reduction in eight Caribbean through the Basic Needs Trust Fund (BNTF). It said the resources will support improved access to quality education; water and sanitation; basic community access and drainage; livelihoods enhancement and human resource development services in low-income and vulnerable communities under the ninth phase of BNTF (BNTF 9). The countries that will benefit from the initiative are Belize, Dominica, Grenada, Guyana, Jamaica, St Lucia, St Vincent and the Grenadines, and Suriname. “The participating countries share many common characteristics and face a number of challenges inherent to small, open economies. BNTF 9 will respond to the development needs of these countries, which face challenges associated with limited diversity in production and extreme vulnerability to natural hazards, which is now exacerbated by climate change and other external shocks,” said Daniel Best, director of projects at the CDB. Initiatives under BNTF 9 will be implemented during the period March 2017 to December 2020. The CDB said that the governments of the eight participating countries will provide total counterpart funding of US$6.4 million. BNTF has implemented more than 2,750 sub-projects over the past 37 years, directly impacting the lives of more than three million beneficiaries in poor communities,” the CDB said, adding that the programme is its main vehicle for tackling poverty in the region, through the provision of basic infrastructure and skills training towards improving the livelihoods of beneficiaries in participating countries. PRESS RELEASE – Belmopan, Belize; November 22, 2016 – The Caribbean Community Climate Change Centre (CCCCC) and the United States Agency for International Development for the Eastern and Southern Caribbean (USAID)/ESC launched the Climate Change Adaptation Program (CCAP) today, November 22, 2016, at the CCCCC’s headquarters in Belmopan, Belize. The CCAP, which will be implemented by the CCCCC, commits US$25.6 million over four (4) years to boost climate resilient development and reduce climate change induced risks to human and natural assets in ten (10) countries. The beneficiary countries are Antigua and Barbuda, Dominica, Grenada, Guyana, St. Kitts and Nevis, Saint Lucia, St. Vincent and the Grenadines, Barbados, Trinidad and Tobago, and Suriname. USAID’s Chief of Mission, Christopher Cushing, the wide array of stakeholders in attendance at the program launch stated that, “this partnership seeks to reduce the risks to human and natural assets resulting from climate variability in the Eastern and Southern Caribbean. We will work together with the 5Cs to create an integrated system to sustainably adapt to climate change in the ECS. The climate resilient development initiative contributes to a coherent regional effort to tackle climate change induced challenges in the Caribbean. It builds upon both USAID’s Eastern and Southern Caribbean Regional Development Cooperative Strategy, which is addressing development challenges in the Eastern and Southern Caribbean, and the CCCCC’s Regional Framework for Achieving Development Resilient to a Changing Climate and its associated Implementation Plan that were unanimously endorsed by Caribbean Community (CARICOM) Heads. “Our helping communities and government manage their water sources or sometimes, the lack thereof, is encouraging the private sector and others to adopt renewable energy approaches while working with governments so they can develop the right frameworks and policies to encourage the uptake of renewable,” states Cushing. 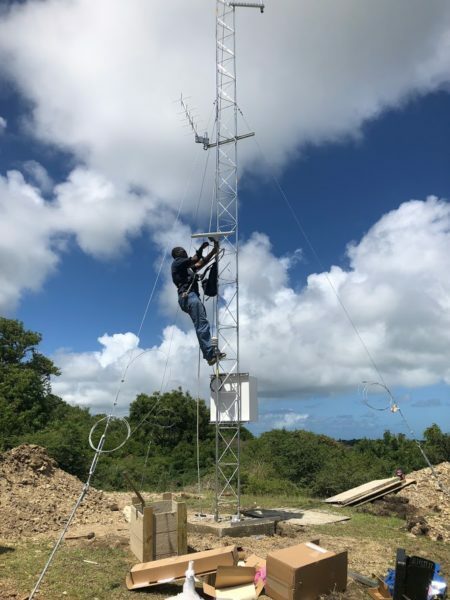 The Executive Director of the Caribbean Community Climate Change Centre, Dr. Kenrick Leslie, added that the Program shows the value of partnership for capacity building and realising tangible outcomes. See photos from the signing ceremony here. “Caribbean countries are particularly vulnerable to the impacts of climate change, with our geographical location leading to high exposure to natural hazards. Economic conditions also play a role, as there is a lack of access to long-term resources to finance sustainable climate-related infrastructure projects. 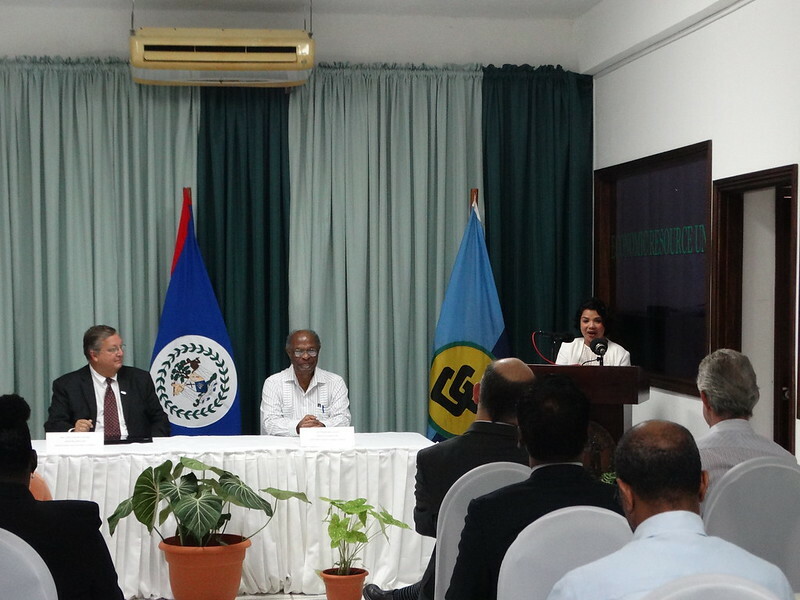 We believe that these additional funds will go a long way towards building resilience and mitigating the impact of climate change in our region,” said Mrs. McKenzie. The funds are being provided by AFD under a Credit Facility Agreement with CDB. AFD is the primary agency through which the Government of France provides funding for sustainable development projects. This marks the first time that CDB has accessed financing from AFD. The Facility will be used by CDB to augment financing for infrastructure projects in several areas: renewable energy, water and sanitation, waste management, adaptation of infrastructure to the effects of climate change, protection of coasts and rivers. Countries that are eligible to benefit from this facility are: Antigua and Barbuda, Belize, Dominica, Grenada, Guyana, Jamaica, St. Kitts and Nevis, St. Lucia, St. Vincent and the Grenadines, and Suriname. The Facility is also complemented by a EUR3,000,000 technical assistance grant, which will finance feasibility studies for projects eligible for financing under the credit facility. The agreement supports the improvement of Caribbean economies’ resilience and vitality through the development of sustainable infrastructure projects with significant environmental or climate impacts. It is in alignment with the Bank’s corporate priority of promoting environmental sustainability. Eight Caribbean countries will benefit from Japanese and United Nations financial assistance to help build their resilience to climate change. On Thursday, the US$15 million Japan-Caribbean Climate Change Partnership was launched at the Radisson Aquatica Resort. It is a partnership between the Government of Japan and the United Nations Development Fund (UNDP). Belize, Dominica, Grenada, Guyana, Jamaica, St Vincent, St Lucia and Suriname are the countries benefiting from the project. Minister-Counsellor and Deputy Head of Mission at the Embassy of Japan in Trinidad, Masatoshi Sato, said his government envisaged that the project will assist the eight regional countries in developing and implementing climate change policies and promoting the adopting of selected adaptation and mitigating technologies through various island projects. He added that the US$15 million project to the eight countries was the forerunner to Japan fulfilling its COP 21 France pledge of approximately US$8.4 billion in public and private finance to developing countries. “As such, Japan expects the project will enable the Caribbean countries to enhance their capacity to cope with climate change and natural disasters, thus assisting them in overcoming vulnerabilities particular to small island states,” the ambassador said. He later told the Nation Japan had invited all CARICOM countries and the eight countries were the ones which had expressed an interest in the project. “They are interested in making their countries more resilient to the impact of climate change,” he added. Meanwhile, UNDP’s Resident Representative for Barbados and the Organisation of Eastern Caribbean States, Stephen O’Malley, told the audience the project aimed to ensure that barriers to the implementation of climate resilient technologies were addressed and overcome in a participatory and efficient manner. “There are many lessons we can learn from Japan and from each other and this project provides ample opportunity for the region to take advantage of Japanese experiences and knowledge, particularly as it relates to energy,” he said. Also speaking was Director of the UNDP regional Bureau for Latin America and the Caribbean Regional Hub, Rebeca Arias, who said December’s Paris agreement must be the starting point of a new era of climate action. “It must permanently shift the global development trajectory towards one that is zero carbon and risk-informed,” she said. Arias added that the project will facilitate climate mitigation and adaptation activities in the eight countries and will help them move towards “a green, no emission development pathway”.